In the 1980s, Willy Brandt struggles energetically against the Super Powers’ nuclear arms race. To secure peace and advance disarmament, the SPD chairman seeks the dialogue with the rulers in the East. In 1987, he resigns the chairmanship of his party and becomes honorary chairman of the SPD. When the Berlin Wall falls in 1989 and the communist dictatorships collapse in Central and Eastern Europe, a dream is fulfilled for Brandt. With enthusiasm he promotes the coalescence of Europe and the national unity of Germany which is restored in 1990. After an extended illness, Willy Brandt dies in Unkel near Bonn on 8 October 1992. On 30 January 1983 in Berlin’s Reichstag Building, a memorial ceremony takes place which looks back on the 50th anniversary of Hitler’s appointment as Reich Chancellor and the beginning of the Nazi dictatorship in Germany. Along with Federal Chancellor Helmut Kohl, Governing Mayor Richard von Weizsäcker and the political scientist, Karl Dietrich Bracher, SPD chairman Willy Brandt also speaks at the event. In his address, he admonishes the Germans not to forget the darkest chapter in their history. Brandt asserts that Hitler’s rise to power was not inevitable and that there was also resistance in 1933. Furthermore, the former Chancellor emphasises the close association between the crimes of the Nazi tyranny, the war which originated from it and the division of Germany. 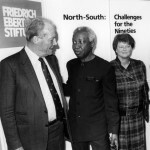 On 9 February 1983, together with Shridath Ramphal and Edward Heath, Willy Brandt steps before the Federal Press Conference in Bonn to present the second report of the North-South Commission to the public. The original English title of the report is “Common Crisis”. The title of the German edition is “Hilfe in der Weltkrise” (“Aid in a World Crisis”). In his introductory remarks, Brandt calls on the international community to take immediate steps to combat the international economic crisis and the debt problems of developing nations. Among other strategies, the Commission suggests broadening international trade, increasing the IMF’s available funds and better promoting agricultural projects. On 15 February 1983, Brandt presents the second North-South Report in Geneva to UN Secretary General Javier Pérez de Cuéllar. On 6 March 1983, new Bundestag elections take place which were occasioned by a vote of confidence on 17 December 1982 which Federal Chancellor Helmut Kohl (CDU) lost intentionally. Clear victor is the CDU/CSU. It just falls short of an absolute majority with 48.8% (+4.3). Chancellor Kohl and the Union can continue to govern with the FDP, which achieves 7.0% (-3.6). For the first time, “The Greens” also enter Bonn’s parliament with 5.6% (+4.1). The clear loser is the SPD. Led by its Chancellor candidate, Hans-Jochen Vogel, it only reaches 38.2% (-4.7). 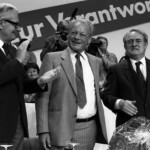 Its chairman, Willy Brandt, promises that the SPD will be a “proper opposition” and declares: “We’ll be back!” As its chairman by seniority, he convenes the Constitutive Meeting of the 10th German Bundestag on 29 March 1983. 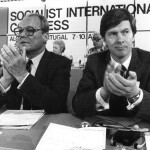 At the Congress of the Socialist International (SI) in the Portuguese city of Albufeira, Willy Brandt is again elected President of the association of socialist parties. In the autumn of 1982, he was still considering relinquishing the office to Olof Palme. Brandt declares his willingness to run again only after some hesitation, as is evident in his letter of 17 February 1983 to Felipe González. As a condition for an addition term in office, the German calls for the replacement of SI General Secretary Bernt Carlsson. However, the personnel recommendations which Brandt makes for this position are rejected by the members of the parties. In addition, there is criticism of the President’s leadership style. Finally, the SI Congress elects the Finn Pentti Väänänen as its new general secretary. The meeting is overshadowed by the murder of its PLO representative, Issam Sartawi. Contrary to the fears of the SPD, Federal Chancellor Helmut Kohl (CDU) continues the Ostpolitik of the social-liberal coalition. There is considerable astonishment when, in summer 1983, even the CSU chairman, Franz Josef Strauß, pursues a policy of détente. The once fiercest critic of the East Treaties engineers a credit in the billions for the GDR and is received on 24 July 1983 by SED General Secretary Erich Honecker. Furthermore, the Bavarian governor travels to Poland and to Czechoslovakia. 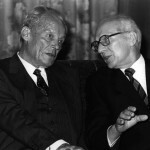 In an interview on 30 July 1983, Willy Brandt can only welcome Strauß’s turn-around on Ostpolitik, but characterises the “uproar” over his trip as exaggerated. The SPD and its chairman declare themselves strongly devoted to developing relationships with the SED leadership in the GDR. To influence the controversial debates in the West to its advantage, the Soviet Union begins a propaganda offensive in late summer of 1983. Besides the peace movement, it is addressed to the SPD as well. In a letter to Willy Brandt, the General Secretary of the CPSU (Communist Party of the Soviet Union), Yuri Andropov, suggests in late August 1983 a renewed limitation of nuclear medium-range systems in Europe. Indeed, Moscow now offers for the first time the reduction of “super-numerous” SS-20 missiles as well, but only on the basis of including British and French nuclear weapons. In no case, Andropov states further, must America be allowed to station Cruise and Pershing II missiles in Western Europe. In his response of 22 September 1983, Brandt expresses understanding for taking the nuclear arsenals of Great Britain and France into consideration. However, he urgently calls on Andropov to immediately begin with the reduction of SS-20 missiles. Brandt and the SPD fear a further intensification of the East-West conflict. On 1 September 1983, the situation escalated dramatically after the Soviet Air Force shot down a Korean civil aircraft with 269 people on board. 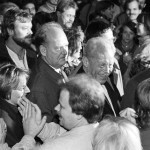 In late September 1983, Willy Brandt travels to the USA. There he would most like to contradict the accusations brought by the CDU/CSU that the security policies of the SPD are neutralist and anti-American. Early in August, Brandt already published an “Open Letter” in the “Washington Post” on the matter. In a lecture in Canton, Ohio, on 28 September 1983 and in the days afterwards in a hearing before members of the US Congress in the capital city Washington D. C., the SPD chairman presents a Four-Point-Plan for a step-by-step “freeze” of testing, production and deployment of nuclear weapons. By doing so, Brandt establishes a connection with proposals by the American peace movement “FREEZE.” He also expresses his opinions to congressional representatives on the German issue and on chances for overcoming the division of Europe. At what was until then the largest peace rally in Germany, approximately 500,000 people demonstrate on 22 October 1983 in Bonn against the planned deployment of new American medium-range weapons in Western Europe. In addition to the writer, Heinrich Böll, and the green-party politician, Petra Kelly, Willy Brandt is also among the prominent speakers. In his speech, the SPD chairman rejects the idea that “Germany be packed full again and again with infernal nuclear machines.” Brandt is bitterly disappointed by the American-Soviet negotiations in Geneva. His reproach that no political will to reach a settlement was evident there, is directed mainly at the US government. Nevertheless, Brandt does not favour withdrawing the Federal Republic from NATO. He also defends the Bundeswehr (the German armed forces). On 25 October 1983, American troops occupy the Caribbean Island of Grenada. A few days earlier, the Marxist-Leninist wing of the ruling party, New Jewel Movement (NJM), overthrew and murdered its own prime minister. The military intervention of the USA, which fears a “second Cuba,” brings a quick end to the communist coup on Grenada. In a statement dated 26 October 1983, Willy Brandt protests as President of the Socialist International (SI) “as sharply as possible” against the US intervention. According to him, it is “completely incompatible with the principles of international law.” Less complimentary for the SI, of course, is the fact that it accepted Grenada’s NJM as a member in 1980. At the time, the voices of those who warned against the extremely left-leaning party were not heard. As decided at the Berlin party convention four years earlier, the SPD votes in autumn 1983 on the re-armament portion of NATO’s dual-track decision. With a large majority, the extra-ordinary party convention in Cologne votes on 18/19 November 1983 against the deployment of new US nuclear missiles and for further negotiations. Only 14 delegates, first and foremost Helmut Schmidt, do not consent to the motion supported by the chairman, Willy Brandt. Despite this, on 22 November 1983, with 286 to 225 votes, the Bundestag in Bonn approves the deployment of 108 Pershing II and 96 Cruise missiles in the Federal Republic. The following day, the Soviet Union leaves the table at the Geneva negotiations on nuclear medium-range weapons (INF). On 8 December 1983, it also breaks off discussions on strategic nuclear weapons (START). 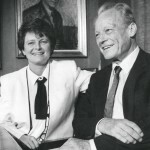 At the Civil Registry Office in their town of Unkel, Willy Brandt and Brigitte Seebacher exchange vows on 9 December 1983. It is his third and her first marriage. The secret ceremony, which the media and public learn about only afterwards, is conducted personally by the mayor of the small town. Nine days later, the SPD chairman celebrates his 70th birthday in Bonn. Among the well-wishers are also Federal President Karl Carstens and Federal Chancellor Helmut Kohl. At Christmas time 1983, after some renovation, an old farmhouse which Willy and Brigitte bought in Gagnières (France) is ready for occupation. In the years to follow, they frequently spend their vacations there in the Cévenne Mountains. 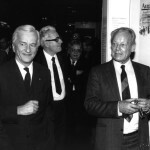 At Willy Brandt’s instigation, from 20 to 22 January 1984 in Rome, a joint meeting of his North-South Commission and the “Independent Commission on Disarmament and Security Issues” led by Olof Palme takes place. The Palme Commission, whose members include Egon Bahr and Shridath Ramphal, published in 1982 the report “Mutual Security” and made proposals in it for halting the nuclear arms race in East and West. The associations between over-arming and under-developing are particularly dear to Brandt. However, as hoped for by Brandt, the incentives for dealing more intensively with the subject do not emanate from the meeting in Rome. 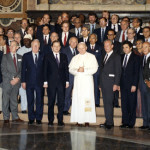 The formal highlight is the meeting of the commission members on 21 January 1984 with Pope John Paul II. 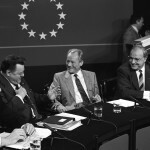 On 10 April 1984 in Rome, the Presidents of the Christian-Democratic, the Liberal and the Socialist International, Andrés Zaldivar, Giovanni Malagodi and Willy Brandt, come together for a discussion. The result of the meeting is a “Joint Appeal on Latin America.” The three Presidents support efforts for peace in Central America, welcome the return of Argentina to democracy and call for an end to the dictatorship in Chile. A few days earlier, Brandt had discussions in Madrid with Felipe González and Bruno Kreisky as well as in Lisbon with Mário Soares. The 70-year-old is as fond of travel as ever: in mid-April, Brandt participates in a North-South conference of the European Council in Geneva. A mere two weeks later in Copenhagen, he chairs a meeting of the SI bureau. At their national convention in Essen from 17 to 21 May 1984, the social democrats adopt ground-breaking resolutions. In the area of security policy, the SPD votes for the concept of “Joint Security” which is attributed to Egon Bahr. The party rejects the NATO doctrine of nuclear deterrence and states that assuring peace is possible only in co-operation with the East. In the fight against massive unemployment in the Federal Republic, the SPD backs the trade unions’ call for shortening the hours worked per week. In addition, the delegates resolve that a commission headed by Willy Brandt should formulate a new programme of basic principles. The SPD chairman is reconfirmed in his office with 391 of 422 votes. In late May 1984, at the invitation of the Communist Party of China, Willy Brandt visits the Peoples’ Republic for the first time. Accompanied by Egon Bahr and Hans-Jürgen Wischnewski, the SPD chairman speaks in Beijing with party boss, Hu Yaobang, as well as with China’s top leader, Deng Xiaoping. 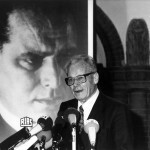 In addition, on 30 Mai 1984, Brandt delivers a speech at the party university. Additional stops on the trip are Shanghai and Guangdong. 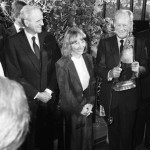 After a stopover in Hong Kong, Brandt flies on to New Delhi where on 5 June 1984, he is received by India’s Prime Minister, Indira Gandhi, with exceptional regard. The topic of their discussion are issues of international economic and security policy as well as a re-assumption of the North-South dialogue. The second direct election of the European Parliament has a disillusioning effect on the SPD. In the voting in the Federal Republic on 17 June 1984, the party gains only 37.4% of the vote. Despite high unemployment, the hoped-for object lesson for the government of Federal Chancellor Helmut Kohl (CDU) is mostly missing. The CDU/CSU reaches 46.0%. However, its liberal coalition partner, the FDP, fails to re-join the European Parliament with 4.8%. The Green Party cuts a surprisingly strong figure with 8.2%. During the election campaign, the SPD and its chairman warned urgently of an even deeper crisis for European integration. “The extant European Community runs the danger of gambling away the idea of European unity,” according to Willy Brandt in an article in March 1984. On 28 September 1984, Willy Brandt departs on a three-week trip to South and Central America. His first stop is Brazil, where he chairs a meeting of the “bureau” of the Socialist International (SI) in Rio de Janeiro. Immediately afterwards, he visits Argentina, Peru, Venezuela, Columbia, Costa Rica, Nicaragua, Cuba and Mexico. 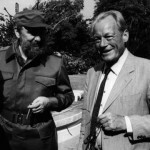 The highlight of the tour is Brandt’s first meeting with Cuba’s head of state, Fidel Castro, on 15 October 1984. The two speak with each other in Havana for a total of nine hours. Brandt is impressed by Castro, which is especially evident in his cordial letter of gratitude. In a speech which he delivers in Mexico City at the end of the trip, the SI President calls on Europe to support Latin America financially in overcoming its debt crisis. In 1984, the “Flick Affair” makes numerous headlines in the Federal Republic. In the course of years, the Flick Concern made political contributions to members of the CDU/CSU, FDP and SPD parties. 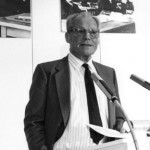 Due to hints of corruption, there is even an accusation in June 1984 against Federal Economics Minister Otto Graf Lambsdorff (FDP), who promptly resigns. An investigative committee of the Bundestag attempts to throw light on the scandal of illegal party finances. On 26 October 1984, Willy Brandt is questioned as a witness because his name is also on a list of monetary recipients. According to his testimony, the SPD chair never received a payment from the Flick Concern. Moreover, he claims to have no knowledge of Flick having given money in Brandt’s name to anyone else in the SPD. 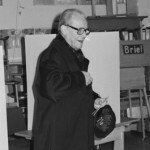 In the series “Speeches about my own country: Germany,” SPD Chairman Willy Brandt delivers an address on 18 November 1984 in Munich’s Kammerspiele Theatre with the title “Searching for history’s opportunities.” In his ruminations about divided Germany, the 70-year-old professes allegiance to the German nation. However, as concerns the possibility of a political unity, he states that the German question is no longer open. According to him, this dream is a thing of the past, especially because of the Federal Republic’s and the GDR’s adherence to different alliances. Brandt even calls the goal of “re-unification” “the lifelong illusion of the fifties.” Both German states should search for commonalities despite and within their division. CDU/CSU politicians and conservative publicists sharply criticise the speech. 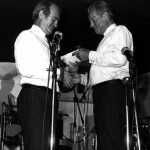 On 29 January 1985, Willy Brandt arrives in Israel for a six-day visit. The SPD chairman and President of the Socialist International is the guest of the Labour Party of Israel’s Prime Minister Shimon Peres. Beside talks with Israeli politicians, his programme also includes a discussion with Arab mayors from Israeli-occupied West Jordan. On 30 January 1985, the former Chancellor receives a special honour. In the vicinity of Nazareth, a forest is named for him in which Peres and Brandt plant the first cypress trees. Two days later, Brandt meets in Jerusalem with the publisher, Axel Springer, who once supported him, but later fought him bitterly because of his Ostpolitik. Their first meeting in 15 years ends on a conciliatory note. In late April 1985, Willy Brandt flies to New York where he speaks at the “Council on Foreign Relations” (CFR). It is his tenth appearance at the think tank since 1958. In addition, Brandt participates in a symposium of the “Third World Foundation,” which awards him the “Third-World Prize.” In his speech at the CFR on 24 April 1985, he directs sharp criticism at the foreign and security policies of US President Ronald Reagan’s administration. The SPD decisively opposes the nuclear arms build-up, the project for a missile defence system (SDI) and the Central America policies of the USA. For this reason, Reagan really does not want to meet the SPD chairman on his upcoming visit to Germany in May 1985. Brandt indignantly rejects accusations by the CDU/CSU that the SPD is anti-American. On 27 May 1985 during his long-planned trip to Moscow, at the Kremlin Willy Brandt meets for the first time with Mikhail Gorbachev. Up until then, no Western politician was able to speak at such length as the SPD chairman does with the General Secretary of the CPSU who came into office only two months earlier. Brandt’s impression of Gorbachev is very positive: He is well-informed, projects a sovereign, unbiased, friendly and also self-assured image. The focal point of their discussion are issues of disarmament, especially the status of the American-Soviet missile negotiations restarted in March 1985 in Geneva. In a one-on-one discussion, the two also talk about Afghanistan which is still under occupation by the Soviet Union. Soon after the meeting, Gorbachev and Brandt begin an active exchange of letters. After Sofia in December 1984 and Moscow in May 1985, a month later Budapest is the next destination for Willy Brandt in communist-ruled Eastern Europe. In a “second phase of Ostpolitik” the SPD chairman wishes to revive East-West détente. 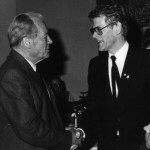 In his talks on 27 June 1985 with the General Secretary of the Hungarian Socialist Workers’ Party (USAP), János Kádár, the concrete topic is the possibilities of co-operation by the two parties. According to information by Karsten D. Voigt, who is witness to this discussion, both sides also discuss the question of how the division of the workers’ movement into social democrats and communists can be overcome. In addition, Brandt also delivers a speech in Hungary’s capital at a congress of “International Doctors for the Prevention of Nuclear War” (IPPNW). On 12 July 1985, President François Mitterrand welcomes the SPD chairman and President of the Socialist International, Willy Brandt, to the French capital. Despite major differences in opinion because of the deployment of new US nuclear missiles in Western Europe in 1983 and French nuclear weapon policies, the two politicians regularly exchange views. The same is true for their parties. Already in May 1985, Brandt travelled to Paris for discussions with the leadership of the Socialist Party. Mitterrand does receive major support from German social democrats for his suggestion to found the European technological community “EUREKA.” Brandt makes that clear in an interview for the magazine “L’Express” which is published on 28 June 1985. At the invitation of Erich Honecker, Willy Brandt travels on 18 September 1985 for the first time in 15 years on an official visit to the GDR. The discussions between the state and party chief of the GDR and the SPD chairman are focused on East-West negotiations and German-German relations, mostly on the sensitive points of the Salzgitter registration office, the Elbe River border and GDR citizenship. On the evening of 19 September 1985, Brandt also speaks with representatives of the Evangelical Church in the GDR. For the East Berlin programme, which he and his wife Brigitte complete and which is closely watched by the Stasi, there is a museum visit, a tour of the city and inspection of a newly constructed district in Marzahn. The following day, the Brandts make a quick visit to Weimar. 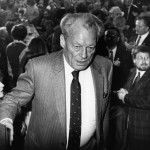 With a visit in Belgrade in mid-October 1985, Willy Brandt continues his trips to the Eastern capital cities of Europe. In meetings with leading politicians of the “Federation of Yugoslavia’s Communists” the SPD chairman speaks mostly about North-South issues. 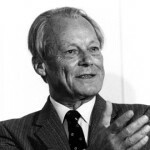 With regard to the debt crisis of developing nations, Brandt campaigns for a Five-Point Programme which he suggested for cancelling the debt of the poorest countries, lowering interest rates and assuring a minimal standard of living for their populations. 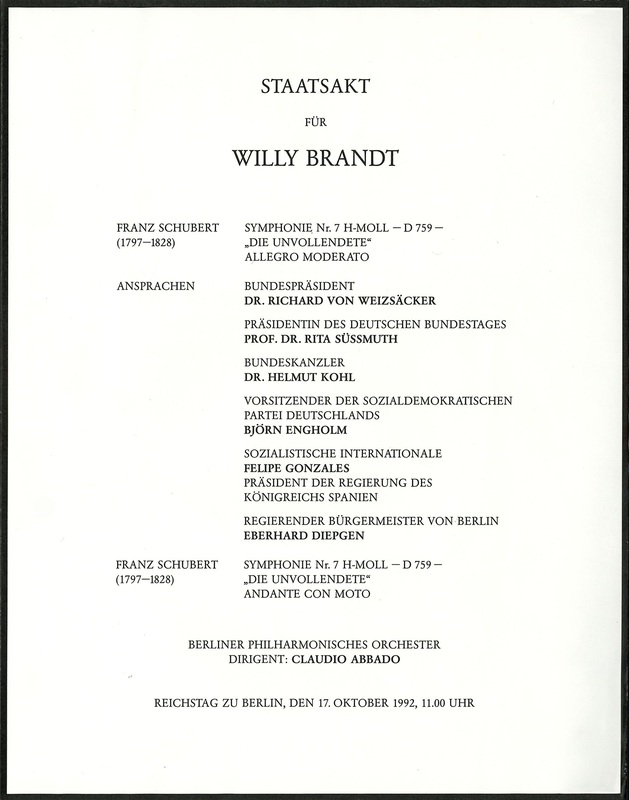 On 14 October 1985, Brandt travels to Vienna. There he introduces his latest book: “Der organisierte Wahnsinn: Wettrüsten und Welthunger”, (English edition: “Arms and Hunger”) chairs a meeting of the “bureau” of the Socialist International and convenes a disarmament conference of the SI. From 7 to 10 November 1985, Prague and Bratislava are the destinations of a long-planned visit by Willy Brandt to Czechoslovakia. A year earlier, the trip by the SPD chairman was cancelled because the communist leadership denied him a visit with Jiří Hájek, the former foreign minister and “Charta 77” spokesman. Brandt has repeatedly intervened with the rulers in Prague on behalf of him and other persecuted dissidents, such as Rudolf Battĕk and Václav Havel. During his visit in 1985, at least the SPD’s executive director, Peter Glotz, is allowed to meet with Hájek and other critics of the regime. On 12 November 1985, Brandt flies to Washington to receive the Albert Einstein Peace Prize. In his speech at the occasion, he expresses in particular his hope that the upcoming first meeting in Geneva between American President Ronald Reagan and Soviet General Secretary Mikhail Gorbachev will lead to a new phase of easing tensions and co-operation. In the US capital, Brandt also has talks with Vice-President George Bush and senators from both parties. Topics included in these talks are the debt crisis of developing countries, the idea of a second North-South summit (Cancun II) and the situation in Central America, especially in Nicaragua. On 21 November 1985, Brandt makes a cautiously positive assessment of the results of the summit meeting in Geneva. On 6 December 1985, Willy Brandt travels on a four-day visit to the Polish capital for the 15th anniversary of the Treaty of Warsaw. His most important partner in discussions there is the communist government and party head, Wojciech Jaruzelski. In addition, the SPD chairman speaks in Warsaw with representatives of the non-communist intelligentsia and the Catholic Church. His speech in Warsaw’s Royal Palace also attracts widespread attention. Intense criticism in the Federal Republic and in parts of Polish opposition circles comes from the fact that Brandt did not meet with Lech Wałęsa, the leader of the banned trade union, Solidarność, by whom he was invited to Danzig. Despite an exchange of letters, which the two maintain from autumn 1985 until spring 1986, their relationship is and remains reserved. Since he took office, the Soviet General Secretary, Mikhail Gorbachev has caused international attention and new movement in East-West relations with his disarmament initiatives. On 15 January 1986, he suggests to the USA a moratorium on nuclear testing, a gradual elimination of nuclear and chemical weapons by the year 2000 and a renunciation of developing space-based weapons. In a letter to Gorbachev dated 29 January 1986, Willy Brandt pledges his support for this initiative. At the same time, the SPD chairman and President of the Socialist International suggests also including short-range nuclear missiles and conventional weapons in the Soviet proposals for the first stage of disarmament. A few months later, Gorbachev and his advisers adopt this idea. A nine-day trip by Willy Brandt to the South of Africa is completely in the spirit of the struggle against apartheid. On 18 April 1986, he participates in Gaborone (Botswana) in a conference of the Socialist International (SI). Before and after that stay, Brandt visits South Africa where, among others, he speaks with Bishop Desmond Tutu and Winnie Mandela, the wife of Nelson Mandela. However, he is denied a visit with the leader of the African National Congress (ANC), who has been incarcerated since 1962 and whose release the SI has demanded. At his meeting on 21 April 1986 with South Africa’s President, Pieter W. Botha, the SPD chairman personally experiences the total obstinacy of the white minority regime. In July 1986, the officials even refuse to deliver a telegram from Brandt to Mandela. 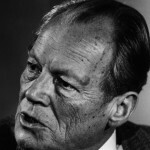 Party DNA and of the trade unions are on the programme for Willy Brandt’s six-day visit to Oslo. Common Future,” introduces the concept of sustainability. 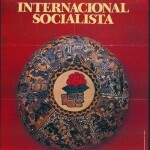 From 20 to 23 June 1986, a Congress of the Socialist International convenes for the first time in Latin America. In his keynote address, Willy Brandt characterises the meeting in Peru’s capital as a milestone. However, during the conference, the struggle in the countryside escalates between the government and the Maoist “Shining Path” guerrillas. On the orders of President Alan García of the leftist party APRA, the military suppresses an uprising of Maoist prisoners. Over 100 rebels, among them unarmed prisoners, are killed. Despite that, Brandt, who is taken aback by the events decides to carry on with the SI Congress in Lima. In an interview with a Peruvian magazine, the SI President explains later that he did not learn of the violent excesses of the military until later. The reactor catastrophe at the Soviet nuclear energy plant at Chernobyl on 26 April 1986 causes the SPD to change its position on energy policy. At its national party convention in Nuremberg, it decides on 27 August 1986 that the Federal Republic should bail out of nuclear energy within ten years. Brandt attempts to appease an aggravated Rau and in Nuremberg offers him in vain the chairmanship of the party. In the end, the 72-year-old is once again elected SPD chairman with 398 of 430 votes. 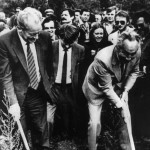 On Willy Brandt’s initiative, the Development and Peace Foundation (SEF) is established in Bonn on 10 September 1986. He developed the idea for this after receiving the “Third-World Prize” in New York in April 1985. The foundation, funded by the state of North Rhine-Westphalia, is meant to be devoted to issues of globalisation and to merge the topics of North-South and East-West issues. The founding members include Johannes Rau, Kurt Biedenkopf, Ralf Dahrendorf and Carola Stern. Brandt becomes chair of the executive committee. 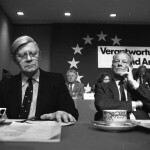 At a symposium of the SEF on the subject of “The Third World and Us” on 5 November 1986 in Duisburg, the 72-year-old emphasises the harmful connection between over-arming and under-developing. According to Brandt, more money must be spent for development instead of for armaments. At their second summit meeting, which takes place in Iceland on 11/12 October 1986, US President Ronald Reagan and Soviet General Secretary Mikhail Gorbachev draw closer to each other in a sensational manner. Both speak in favour of abolishing atomic weapons and want to take the first step by eliminating all nuclear medium-range missiles (INF) in Europe as well as cut in half the number of strategic offensive weapons. However, things do not yet reach a breakthrough, because Reagan refuses to agree to a ten-year ban on testing for the SDI. In a letter to Gorbachev dated 10 November 1986, Willy Brandt praises the fact that in Reykjavik a new kind of thinking has begun. At the same time, he expresses his dismay over Federal Chancellor Helmut Kohl, who compared Gorbachev to Nazi Propaganda Minister Goebbels. In the 1986/87 Bundestag election campaign, the train is again a popular means of transportation for the principal politicians of the SPD. In early December 1986, a special train with Willy Brandt on board makes stops in Neustadt a. d. W. (on the wine route), Böblingen, Reutlingen, Oberndorf, Villingen-Schwenningen and Constance. In mid-January, Neuß, Bottrop, Münster, Hamburg, Elmshorn and Flensburg are on its schedule. Meanwhile, Chancellor candidate Johannes Rau’s expressed goal of a majority seems unachievable for the SPD. The scandal involving the trade union enterprise “Neue Heimat” is bedevilling the campaign. After heavy losses for the party in elections in Bavaria and Hamburg in autumn 1986, criticism of the SPD chairman becomes louder and speculation arises about his possible resignation. Brandt rejects both energetically. In the election for the 11th German Bundestag on 25 January 1987, the SPD with its Chancellor candidate, Johannes Rau, clearly fails to achieve its originally targeted majority. At least the result of 37.0% (-1.2) is better than many observers suspected in light of the way the campaign proceeded. Again, the CDU/CSU with Federal Chancellor Helmut Kohl is the clear electoral victor. The Union gains 44.3%, however it has to accept clear losses with -4.5 percentage points compared with Bundestag election results in 1983. Nevertheless, the CDU and CSU can continue the coalition with the FDP, which gains 9.1% (+2.1). The strongest gain is registered by “The Greens,” who improve to 8.3% (+2.7). 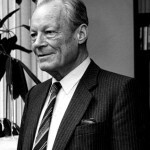 As in 1983, Willy Brandt as chairman by seniority convenes the Constitutive Meeting of the newly elected parliament in Bonn on 18 February 1987. 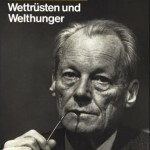 In a programmatic written work which appears in February 1987, Willy Brandt documents his personal views and experiences on the subject of human rights. In the preface of the book, “Human Rights – mistreated and misused”, he rejects the idea of using violations of human rights in other countries as a propaganda weapon in ideological disputes. Moreover, the goal of politics must always be to save the victims. The equal value of social, civil and political human rights rank among further highly controversial maxims of the SPD chairman and President of the Socialist International. Furthermore, whoever is part of the West must willingly be subject to more rigorous standards of judgement. Brandt also considers assuring peace to be just as important as ensuring human rights. In practical efforts for politically persecuted individuals, the former Chancellor sets more store by quiet diplomacy working behind the scenes than by loud public protests. During his discussions with communist leaders in the Eastern Bloc and with Western-oriented dictatorships, he always submits with discretion a list of names with urgent cases in order to achieve the release of political prisoners or improved conditions of incarceration for them, to bring families together and to make it possible to leave a country. 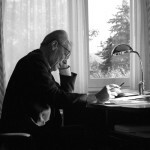 Although many of his interventions are successes, Brandt does not gain a public reputation as a tireless advocate for human rights. 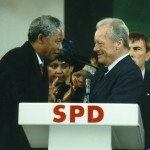 On 23 March 1987, after over 23 years at the head of his party, Willy Brandt announces his resignation as SPD chairman. The occasion is the intense protest by many social democrats against the appointment of the unaffiliated Greek Margarita Mathiopoulos as spokesperson for the executive committee. The long-smouldering dissatisfaction with Brandt’s leadership style continued to increase since the Bundestag election defeat. In his resignation statement to the party’s executive committee, which resembles a settling of accounts, the 73-year-old defends himself against this criticism. 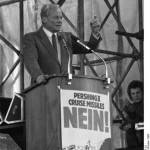 He bemoans the lack of discipline in the SPD and characterises the discussion about the new spokesperson as “an uprising of narrow-mindedness.” In retrospect, Brandt considers it a mistake to have stated his intention at the party convention in Nuremberg not to run again for the chairmanship in 1988. On 14 June 1987 at an extra-ordinary party convention in Bonn’s Beethoven Hall, Willy Brandt says farewell as party chairman of the SPD. As his successor, the delegates elect Hans-Jochen Vogel, who is already head of the SPD fraction in the Bundestag. Brandt is named honorary chairman of the party. From 7 until 11 September 1987, the GDR’s head of state and party, Erich Honecker (SED), travels for the first time on an official visit to the Federal Republic. He is welcomed in Bonn by Federal Chancellor Helmut Kohl (CDU) with full military honours. 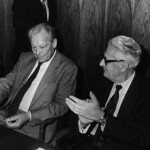 On the evening of the second day, Honecker meets with Willy Brandt for a discussion in the Bristol Hotel. The SPD chairman is deeply moved when Honecker thanks him for his major contribution to détente in Europe and to the normalisation of German-German relations. 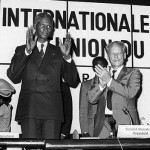 On 15/16 October 1987 in Senegal’s capital city, the Socialist International (SI) holds a council meeting. Three days earlier, the SI hosted a conference in Dakar on “Democracy and Development” with the participation of 23 African organisations and parties. In his speech at the convening of the council, Willy Brandt affirms the support of the Internationale for the democratic opponents of apartheid in South Africa and the “front-line states” in Southern Africa. Furthermore, the SI President calls for debt forgiveness for the poorest countries. As a pre-condition for membership in the Internationale, he mentions acceptance of political pluralism. However, that does not always mean that the country from which the applicant party originates must necessarily have a multi-party system. On 8 December 1987, US President Ronald Reagan and Soviet General Secretary Mikhail Gorbachev sign the INF Treaty. Within three years all land-based nuclear missiles of the USA and the Soviet Union with a range of 500 to 5500 kilometres are to be completely destroyed, among them all SS-20, Cruise and Pershing II missiles. In the first three months of the year 1988, Willy Brandt travels frequently throughout Europe. In January, he participates in a four-day meeting of 76 Nobel Prize recipients at the Élysée Palace in Paris, attends the party convention of the Spanish Socialists in Madrid, is in Strasbourg for the beginning of a North-South campaign of the European Council and opens an August Bebel exhibition in Berlin. In mid-February 1988, Brandt flies to Geneva for a meeting of the disarmament council of the Socialist International (SI). After that, he travels to Madrid and Barcelona for book presentations. The SPD honorary chairman and SI President makes another stop in Paris in late February for an event of the socialist fraction of the European Parliament and in early March a conference of the Labour Party in London is on his programme. In spring 1988 inside the Kremlin, a second meeting occurs between Willy Brandt and Soviet General Secretary Mikhail Gorbachev. 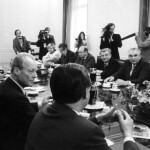 In their discussion on 5 April 1988, not only are East-West issues and North-South relations the topics, but also the domestic political developments in the Soviet Union. Under the guiding concepts of “glasnost” (openness, transparency) and “perestroika” (renovation, change), Gorbachev is attempting to democratise the Soviet state. What Brandt learns first-hand from this is “breath-takingly interesting” for him. “Perestroika” is “so much like a revolution,” the SPD honorary chairman rhapsodises. 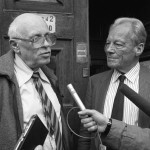 During his stay in Moscow, Brandt also meets with the Soviet dissident Andrei Sakharov, who was released from years of banishment in late 1986. In early August 1988, Willy Brandt turns in secret letters to the heads of state and party in the Soviet Union and Romania, Mikhail Gorbachev and Nicolae Ceaușescu. He does this at the request of Hungary, whose relationship with its neighbour and Warsaw Pact ally, Romania, is severely strained. The Ceaușescu regime began in spring 1988 to destroy thousands of villages and to relocate their residents. Mostly, the Hungarian minority in Romania, which numbers about two million people, is affected by this serious violation of the CSCE Final Acts. However, Brandt’s appeals yield no results. 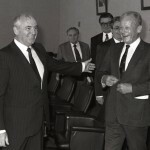 Gorbachev considers himself unable to intervene and Ceaușescu, who is becoming more isolated internationally, does not even reply to the former Chancellor’s letter. In autumn 1988, Willy Brandt is travelling frequently again. Shortly after the SPD national party convention in Münster, he participates on 8/9 September in Berlin in a meeting of the economic policy committee of the Socialist International, followed by a congress in Pisa and a symposium on “The World 10 Years after the Brandt Report” in Vienna. In November 1988, Brandt is once again in the city on the Danube to attend the opening of an exhibition on the history of the Austrian workers’ movement. In the same month, the 74-year-old appears at an international congress in Hamburg on the subject of “Climate and Development” and also spends a period of time in Athens. In early December, Brandt chairs an SI council meeting in Paris. 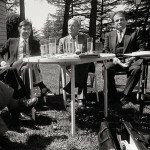 The spring meeting of the council took place in Madrid under his leadership in mid-May 1988. 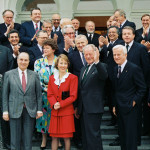 Among the international guests who pose with the Brandts for a group photograph are: François Mitterrand, Mário Soares, Shimon Peres, Helmut Kohl, Gro Harlem Brundtland, Hans-Dietrich Genscher, Johannes Rau, Hans-Jochen Vogel, Shridath Ramphal, Rainer Barzel, Björn Engholm, Peter Glotz, Holger Börner, Ingvar Carlsson, Walter Scheel, Oskar Lafontaine, Bruno Kreisky, Egon Bahr and Valentin Falin. On 14 February 1989, the Iranian revolutionary leader, Ayatollah Khomeini, calls on all Muslims to murder Salman Rushdie, the British author of the book, “The Satanic Verses.” In Khomeini’s view, the work blasphemes the Prophet Mohammed and the Koran. Iran offers substantial rewards for killing Rushdie, who is forced to go into hiding. To this very day the call to homicide has not been revoked. Meanwhile, the reward money for Rushdie’s death now amounts to more than 4 million US dollars. 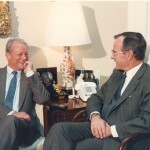 In a letter of 1 March 1989 to the new US President, George Bush, Willy Brandt and Shridath Ramphal suggest calling for a summit based on the example of the meeting of Cancún in 1981. They also direct a letter of similar content to the Soviet President, Mikhail Gorbachev. Since 1984, Brandt has been considering a Cancún II initiative which he has brought up in discussions with other statesmen and -women. Now he and his fellow campaigners from the North-South Commission consider the international situation especially favourable. In view of the debt crises and the economic weakness of many developing nations, as well as growing global problems such as environmental damage, warming of the climate, population growth and the drug trade, Brandt and Ramphal are convinced of the necessity of a second North-South summit. In early March 1989, the German travels to Washington to personally deliver the letter to Bush. However, at the gate of the White House, Willy Brandt has to introduce himself and spell out his name. Inside he is received only by the national security adviser, Brent Scowcroft. The US government is obviously not interested in the Cancún II initiative. Not until August 1989 does Brandt receive a written reply from Scowcroft. According to that, the Bush administration is doubtful about the usefulness of a summit. Economic development can best be achieved through reforms “which allow market forces to operate freely,” the Presidential adviser writes. 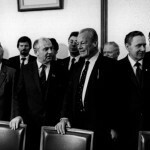 At a “round table” the communist government and the opposition in Poland agree on 5 April 1989 to re-certify the trade union Solidarność, which overwhelmingly wins the partially free elections two months later. The winds of change are also blowing in Hungary. The communists there advocate a multi-party system and begin in May 1989 to dismantle the blockades on the border with Austria. On his first state visit in the Federal Republic in mid-June 1989, Soviet President Mikhail Gorbachev is welcomed with great favour by the Germans. Besides his consultations with Federal Chancellor Helmut Kohl, the guest also has time for talks with representatives of the SPD opposition. 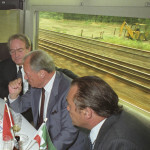 On 15 June 1989, Gorbachev and his foreign minister, Eduard Shevardnadze, travel by train from Bonn to Dortmund with Johannes Rau, governor of North-Rhine-Westphalia, and Willy Brandt. Along the way, the SPD chairman emeritus demonstrates his sense of humour when he makes a point in a joke about the GDR leadership’s unwillingness for reforms. 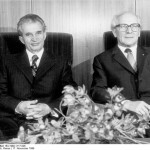 In a speech in the Bundestag on the following day, Brandt praises the outcome of the visit, especially the Joint Statement signed by Kohl and Gorbachev. 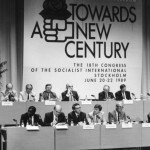 Tradition and a new beginning characterise the Congress of the Socialist International (SI) in Stockholm from 20 to 22 June 1989. The SI celebrates the 100th anniversary of the founding of the Second Internationale and adopts a new statement of principles. In his speech, Willy Brandt campaigns for democratic socialism and offers to work together with reform forces in the East. At the same time, the re-elected President clearly distances himself from the communist leadership in China, which crushed the democracy movement in Beijing in early June. For the first time, the PLO is at an SI Congress as an observer. Brandt regrets that the Israeli Labour Party refuses to attend for that reason. In an earlier discussion with Shimon Peres, he made it clear, however, that he was standing by the invitation to the PLO. In the summer of 1989, Willy Brandt completes the manuscript for his memoirs. His wife, Brigitte, supports him with words and deeds. The autobiography “Erinnerungen” appears in the Ullstein Publishing Company, which belongs to the Springer Concern, and is released in October 1989. Brandt’s look back at his fascinating political life enjoys a broad readership and is reprinted time and again. Since the SED regime refuses to enact any kind of reforms, more and more people want to leave the GDR. The massive exodus begins in late summer 1989. On 10 September, Hungary’s government allows GDR citizens, who came by the tens of thousands into the country, to travel by way of Austria to the Federal Republic. At the same time, thousands of East Germans flee into Bonn’s embassies in Prague and Warsaw to force their departure. In the GDR, the number of those now openly demonstrating against the SED and for changes continues to grow. On 1 September 1989 in a speech in the Bundestag, Willy Brandt declares that the “policy of small steps” is coming to an end. Twenty days later, he writes in a contribution for the “Bild” newspaper, that the German issue has become part of the European agenda. 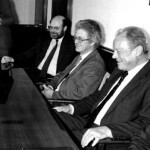 A few days after visits to Athens and Paris, Willy Brandt flies to Moscow in mid-October 1989 where he meets once more with Mikhail Gorbachev. At their exchange of opinions on 17 October 1989, the dominant topic is the situation in the GDR. The Kremlin chief avoids the question of whether the two German states, considering further possible consolidation in Europe, have chances of coming under a common political system. Just as reserved is Gorbachev’s reaction to Brandt’s information about the founding of the Social Democratic Party (SDP) in the GDR which immediately applied for admission to the Socialist International. In a “Spiegel” interview, Brandt reports that he agrees with the Soviet President that fundamental changes need to occur quickly in the GDR. In late October 1989, for the first time, Willy Brandt visits South Korea which made a successful transition in 1987 from a military dictatorship to a democracy. The programme for the SPD chairman emeritus includes a meeting with President Roe Tae-Woo, accepting an honorary doctorate from the National University in Seoul, a lecture on the perspectives for international relations, a televised discussion on “Ostpolitik in Germany and Nordpolitik in Korea” as well as a tour of the border between the two Koreas. The German guest receives an especially warm welcome from Kim Dae Jung. Since 1973, Brandt repeatedly spoke up for the opposition politician who was at one time persecuted by the military regime. Most of all Kim owes it to an intervention by Brandt that he was not executed in 1980. Willy Brandt learns on the evening of 9 November 1989 in the Bundestag in Bonn about the immediately valid freedom to travel for GDR citizens. However, not until the following morning does he learn from an early phone call that the border was opened during the night. A few hours later, the deeply moved former Chancellor stands in the midst of a crowd of people before the Berlin Wall at the Brandenburg Gate. Around noon he states in an interview at Schöneberg Town Hall: “Now we are in a situation in which what belongs together will grow together.” At a rally in front of the Town Hall, at which Helmut Kohl and Hans-Dietrich Genscher also appear, Brandt delivers an address that evening. Afterwards he travels with Hans-Jochen Vogel to East Berlin for a meeting with representatives of the Social-Democratic Party in the GDR. The meeting of the council of the Socialist International (SI) in Geneva on 23/24 November 1989 occurs completely under the influence of the fall of the Berlin Wall and the dramatic upheavals in East Central Europe. During this phase, contacts to European partners are especially important to Brandt: In the first half of November, he already took part in a meeting of SI party leaders in Milan, travelled to Amsterdam and met in Brussels with members of the socialist fraction of the European Parliament. At the invitation of social-democrats of the hanseatic city, Willy Brandt comes to Rostock on 6 December 1989 for his first public appearance in the GDR. For this event, Pastor Joachim Gauck places the Church of St. Mary at his disposal. Because the church is overcrowded, the address of the SPD chairman emeritus is broadcast by loudspeakers into the surrounding streets so that almost 50,000 people are able to hear it. 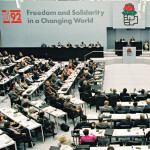 At an extra-ordinary party convention, which has been moved on short notice from Bremen to Berlin, the SPD adopts on 20 December 1989 its new programme of basic principles. The principal demand is the ecological restructuring of industrial society. However, this subject is forced into the background by the democratic revolution in the GDR and in Eastern Europe. 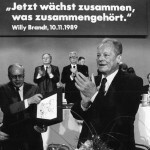 Most of all, Willy Brandt is the one who puts his imprimatur on the convention with a speech for German unity. On his 76th birthday, the SPD chairman emeritus states: “Such a major guilt of a nation cannot be wiped away by a timelessly decreed division.” That is directed at the argumentation of sceptics and opponents of a national unification, whose spokespersons are Oskar Lafontaine and Günter Grass. Ten years after the publication of the first Brandt Report, the Friedrich-Ebert Foundation issues invitations to a North-South Conference in Königswinter near Bonn. 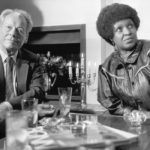 Among the participants are, beside members of Willy Brandt’s former North-South Commission, also politicians and experts who belonged to one of the three independent commissions headed by Olof Palme, Gro Harlem Brundtland and Julius Nyerere. In his keynote address, Brandt asserts that the 1990s must become the decade of global negotiations. At the same time he outlines elements for a future policy for world order and thus gives the impetus for a new working group. It is founded in June of 1990 in Stockholm under the chairmanship of Ingvar Carlsson and develops proposals for a reform of the international system. From 22 until 25 February 1990 in Leipzig, the first regular party convention of the social-democrats in the GDR takes place. 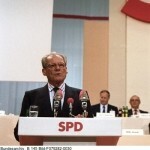 In mid-January 1990, the party, which was founded on 7 October 1989 as the SDP, renames itself the SPD. In the meantime, its relations with the West German SPD have become quite close. 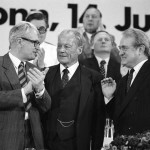 The party convention in Leipzig elects Ibrahim Böhme as its chairman and names Willy Brandt, who is in attendance, as honorary chairman of the East German SPD as well. Because of his decisive advocacy for German unity, the 76-year-old enjoys especially high regard in East Germany. Tens of thousands come to the streets and market squares for his appearances as happens otherwise only with Federal Chancellor Helmut Kohl. 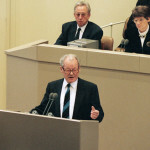 In late February 1990, Brandt gives speeches in Leipzig, Plauen and Zwickau. In late January, he already visited Eisenach and Gotha. 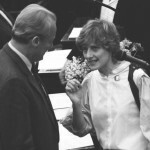 On 18 March 1990, the results of the first free election to the Volkskammer (People’s Chamber), the parliament of the GDR, is a bitter disappointment for the social-democrats. Their favoured East German SPD receives only 21.9% of the vote. The clear victor with 48.1% is the electoral coalition “Alliance for Germany,” to which the Eastern CDU, Democratic Renewal (DA) and German Social Union (DSU) parties belong. Even Willy Brandt had counted on a clearly better result for the SPD. As a tireless campaigner, in March 1990 he made appearances in Erfurt, Weimar, Gera, Dresden, Chemnitz, Eberswalde, Frankfurt/Oder, Neuruppin, Potsdam, Wismar, Greifswald, Stralsund and Rostock. In April 1990, the Alliance parties, the SPD and the liberals form a grand coalition. The new prime minister is Lothar de Maizière (CDU). 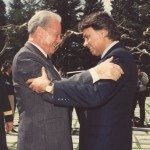 During a two-day visit to the Spanish capital city in early April 1990, Willy Brandt meets again with Felipe González. The meeting of the two friends of many years is characterised as always by exceptional cordiality. Six months earlier, the socialist prime minister, who has been in office since 1982, won the parliamentary elections in Spain for the third time. In the European Community, González is one of the few heads of government who without hesitation supports the process of German unification after the fall of the Wall. 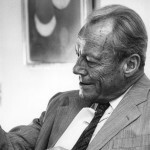 In May 1990, Willy Brandt completes a highly strenuous travel programme: On 5 May he flies to the USA to receive an additional honorary doctorate in Providence (Rhode Island). From 9 to 11 May, the 76-year-old stays in Bergen (Norway), where he appears in a televised discussion with Gro Harlem Brundtland. On 14/15 May, Brandt is a guest in Prague and Bratislava at the invitation of the Czechoslovakian President Vaclav Havel. A week later he takes part in an SI council meeting in Cairo as President of the Socialist International. On 24 May, he travels to Pakistan, India and the Philippines for nine days. 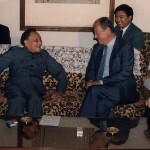 During that time, Brandt holds talks with Prime Minister Bhutto in Islamabad, the head of government, Singh, in New Delhi and President Aquino in Manila. Four months after his release from 27 years of incarceration, Nelson Mandela visits Bonn for the first time on 11 June 1990. Along with discussions with the federal President, the Chancellor and several government ministers, a visit to the SPD party headquarters is also on the programme for the visitor from South Africa. There Mandela, who wishes to thank the social-democrats for their support of the struggle for freedom by black South Africans, is enthusiastically welcomed by thousands of people. With the economic, currency and social union on 1 July 1990, the D-mark is introduced in the GDR as well. However, for that purpose the treaty concluded by the two German states is controversial in the SPD. 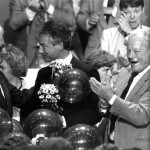 On 21 June 1990, against the will of its Chancellor candidate, Oskar Lafontaine, the SPD Bundestag fraction votes by an overwhelming majority in favour of the treaty. This is especially credited to party chairman, Hans-Jochen Vogel, and Chairman Emeritus Willy Brandt. In a letter to Lafontaine dated 18 May and in a speech to the fraction on 14 June, Brandt explains why he will by no means vote “No” in the Bundestag. After this, the SPD leadership finds it difficult to convince Lafontaine, who was seriously injured in an assassination attempt in late April 1990, not to withdraw as Chancellor candidate. On 29 July 1990, the social-democrat and former Austrian Chancellor, Bruno Kreisky, dies. 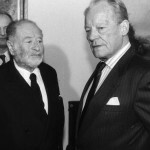 In June 1990, Willy Brandt last met with his close associate whom he had first met fifty years before in Sweden. At the funeral in Vienna on 7 August 1990, the President of the Socialist International (SI) and chairman emeritus of the SPD delivers the eulogy. On 27 September 1990, six days before the re-establishment of the political unity of Germany, the Western and Eastern SPDs unite. 67 years after being banned by the Nazis and 44 years after the forced unification with the KPD in the Soviet zone, there is again a Social-Democratic Party for the entire country. Together with its chairmen, Hans-Jochen Vogel and Wolfgang Thierse, as well as Chancellor candidate, Oskar Lafontaine, the chairman emeritus, Willy Brandt, signs the document of unification. The manifesto, which is adopted along with it, is largely written by him. However, Brandt is dissatisfied with the sceptical attitude of Lafontaine and some of his friends in the party toward German Unity. Two months before the first all-German Bundestag elections, the SPD is still divided on this issue. With the accession of the territory of the GDR to the Basic Law on 3 October 1990, the political unity of Germany is re-established. With tears in his eyes, Willy Brandt stands at midnight on the VIP stand at the celebration along with Federal President Richard von Weizäcker, Federal Chancellor Helmut Kohl and Foreign Minister Hans-Dietrich Genscher. 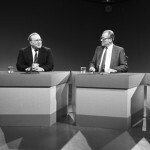 A few days earlier, to the considerable aggravation of SPD Chancellor candidate Oskar Lafontaine, Brandt and Kohl demonstrated their non-partisan consensus in the matter of German Unity in a joint television interview. At the first all-German Bundestag session on 4 October 1990 in Berlin, it is also the SPD chairman emeritus Brandt who replies for his fraction to the Chancellor’s government policy statement. In August 1990, Iraq attacked and annexed its neighbour Kuwait. Immediately thereafter, the UN issues an ultimatum demanding the withdrawal of the Iraqi military. While the USA is hammering together a coalition of forces against the aggressor and stations troops in Saudi Arabia, Iraq’s dictator, Saddam Hussein, is holding several thousand foreigners prisoner. 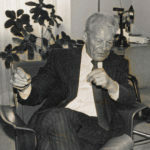 As other Western politicians previously, but without the backing of the Federal government, Willy Brandt travels to Bagdad on 5 November 1990 to gain the release of hostages. In addition, he would like to sound out the chances for peace as President of the Socialist International. After two conversations with Saddam and difficult negotiations, Brandt can take almost 200 people, among them 138 Germans, home with him. Unsuccessful by contrast are his efforts to move Iraq to withdraw from Kuwait. The first all-German Bundestag elections on 2 December 1990 end as expected with a clear victory for the coalition partners CDU/CSU and FDP. The Union with Federal Chancellor Helmut Kohl (CDU) receives 43.8% of the vote, the Liberals with Foreign Minister Hans-Dietrich Genscher receive 11.0%. The SPD with Chancellor candidate Oskar Lafontaine only receives 33.5%. While the Greens fail to clear the 5% hurdle, the Bündnis 90 and the SED successor party, PDS, gain admission to the parliament. Willy Brandt makes no secret of his disappointment over the weak showing of the SPD. On 3 December, in a contribution to a discussion before the party’s executive committee in Bonn, he bemoans the fact that the SPD did not commit itself more clearly to German unity. During the meeting, Lafontaine renounces the chairmanship of the party. On 14 January 1991, a few hours before the deadline of the UN ultimatum to Iraq on withdrawing its troops from Kuwait, the Bundestag in Bonn debates the situation. 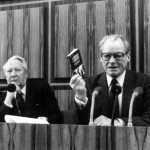 Directly after the government policy statement by Federal Chancellor Helmut Kohl (CDU), Willy Brandt rises to speak. In his speech, the SPD honorary chairman gives reasons why his party rejects the use of military measures even after the expiration of the ultimatum. According to Brandt, neither is there an automatism for intervention nor have non-military sanctions against Iraq been implemented effectively enough. In case of a war on the Persian Gulf, he fears a conflagration in the Middle East. Regardless of that, the attack by the coalition of countries led by the USA begins three days later. By mid-February 1991, Kuwait is liberated militarily. Willy Brandt’s zest for travelling is unbroken. Besides his many obligations in Germany, he had, from September 1990 until January 1991 appointments in Vienna, Tampere, Gothenburg, New York, London, Lisbon, Coventry, Los Angeles, Las Vegas and Tokyo. His next foreign tour takes him in March 1991 once around the globe. First, Brandt stops in the USA for lectures in Louisville (Kentucky), Palm Springs and San Francisco (California). After that the 77-year-old flies for the first time to Australia. On 9/10 March, as President of the Socialist International, he conducts a meeting in Sydney of party leaders of the SI. 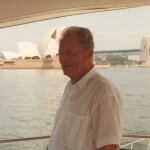 After a side-trip to New Zealand’s capital, Wellington, Brandt arrives on 15 March in Singapore, where he speaks with the former Prime Minister, Lee Kuan Yew, and others. The memorandum on the further development of the United Nations is the result of a work group led by Ingvar Carlsson, and harkens back to a suggestion by Brandt from January 1990. The initiative also reacts to an extent to the Gulf War of 1990/91. On 10 May 1991 in New York, the former German Chancellor gives the memorandum to UN Secretary General Perez de Cuellar. Based on that, in 1992 the independent “Commission on Global Governance” is founded. Due to illness, Brandt’s participation in this body is no longer possible. 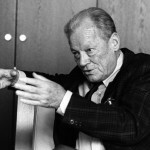 Since unification on 3 October 1990, Willy Brandt states repeatedly that a Germany which has grown larger must accept more responsibility internationally. In an interview for the “Süddeutsche Zeitung” of 10 May 1991, he pleads for making it possible for the Bundeswehr (the federal armed forces) to participate in military missions which are undertaken by the United Nations. Brandt is able to achieve this only partly in the SPD. 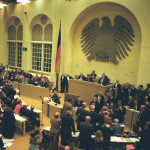 Subject to a change in the Basic Law, the social-democrats vote at their national convention in late May 1991 for a German participation in peace-keeping UN missions (blue helmet missions). But they exclude participation in combat missions. The party convention in Bremen brings about a change at the top: Björn Engholm is elected the new SPD chairman. Since 3 October 1990, Berlin is again Germany’s capital city. However, the question of where the government and parliament of the expanded Federal Republic should have their seat in the future is still open. On 20 June 1991, the Bundestag makes its decision on Bonn or Berlin. Willy Brandt belongs to those who definitely favour a move from the Rhine to the Spree. In the debate in Bonn’s water works, the temporary location of the Bundestag after re-unification, he reminds everyone of the resolutions made since 1949 and the promises of the Bundestag for the capital city Berlin. However, a misunderstanding is caused by his remark that in France no one had thought of keeping the capital in Vichy after returning the capital to Paris was possible again in 1944. To Brandt’s great joy, in the end Berlin wins over Bonn with 338 to 320 votes. In the summer of 1991, Europe and the world look with concern at developments in the Soviet Union and in Yugoslavia. In August, old-guard communist forces in Moscow engineer a coup against President Mikhail Gorbachev. Indeed, the overthrow attempt fails after three days, but the break-up of the Soviet Union can no longer be prevented. In the multi-nation state of Yugoslavia there is even a civil war after Slovenia and Croatia declared their independence in June. 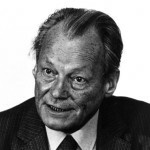 In an interview with the newspaper, “Die Welt” of 16 September 1991, the SPD honorary chairman Willy Brandt warns against “overreaching nationalism” and “racism.” For security in Europe, he is counting primarily on NATO instead of the EC or the CSCE. According to Brandt, the Atlantic alliance has proven itself to be a factor for stability. Because of intense pain in his left leg, Willy Brandt undergoes medical treatment in September 1991. After several examinations, cancer of the colon is finally diagnosed. On 10 October 1991, Brandt is operated on at the University Clinic in Cologne and a tumour is removed. Nine days later, the 77-year-old leaves the hospital and can keep some of his appointments after a few weeks. But tissue samples indicate that the cancer was very aggressive and will most likely return. Brandt’s wife, Brigitte Seebacher, is informed of the diagnosis by the attending physician. She is in agreement with the doctor: It is the right decision for her husband that he no longer has to go through the possible but protracted and highly debilitating therapy. 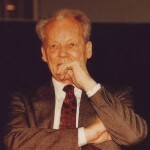 On 15 November 1991 at a memorial event in Berlin’s Gethsemane Church on the occasion of Julius Leber’s 100th birthday, Willy Brandt delivers the address “On the legacy of German resistance.” The SPD honorary chairman honours the resistance fighter as a “life-affirming, vigorous, hard-working” man, great social-democrat and a German patriot with a European perspective. At the same time Brandt also remembers his personal connection with Leber, who was his first mentor in Lübeck until their break in 1931 and with whom he kept in contact during the Second World War through mediators. Helmut Schmidt also speaks at the event. Afterwards, he and Brandt withdraw for a one-on-one discussion during which the two former Chancellors reconcile. In his speech, the former Chancellor explains that Western Europe has been an immigration region for a long time and will remain under immigration pressure for the foreseeable future due to the difference in prosperity with regard to Eastern Europe and its Southern neighbours. For that reason, Brandt calls for a common European policy on immigration and asylum. Most of all because Europe’s capacity to accept immigrants is limited, more must be done immediately about the causes of migration and movements of refugees so that people could remain in their home countries. In Western Europe, according to Brandt, in any event, people must adjust to living with more foreigners among them. In that case, they must take vigorous action against tendencies to xenophobia. Of course, no one should downplay the considerable strains which come about due to rapid increases in immigration to cities and communities. Thereby, Brandt has in his sights the situation in Germany. After the fall of the Iron Curtain, the number of asylum-seekers, refugees and late repatriates in the Federal Republic increased sharply. Moreover, this has already led to xenophobic excesses. In the summer of 1992, the SPD chairman emeritus will advise his party to vote for an amendment to the article in the Basic Law concerning the right to asylum. After the failure of all efforts for a new treaty of union, the Soviet Union is dissolved in late 1991. On 25 December in Moscow, Mikhail Gorbachev ceded power to Russia’s President, Boris Yeltsin. The previous partial republics are now independent. Eleven of them join the Commonwealth of Independent States (CIS), a loose association. 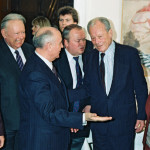 On 5 March 1992 in Bonn, Gorbachev meets once more with Willy Brandt. At the beginning of the conversation, the former communist chief declares: “I am a social-democrat.” Brandt already pointed out Gorbachev’s historical accomplishments in January in a personal letter. In particular, he thanks the former Soviet President for his contributions to the unification of Germany and to peaceful transformations in Europe. Brandt expressly comes to the defence of those individuals who maintained contacts with the regime of injustice so as to render aid to fellow human beings. Beyond that, the SPD chairman emeritus and former Chancellor defends his Ostpolitik and his policy on Germany from the accusation of having made the communist regimes more stable and having unnecessarily lengthened their existence. In fact, according to Brandt, those policies contributed to overcoming them. In the spring of 1992, Willy Brandt travels abroad three more times. In mid-March in Madrid, he conducts a meeting of the presidium of the Socialist International (SI). In January, Brandt has already informed his friend, Felipe González, by letter that he no longer wishes to run for President at the upcoming SI Congress in Berlin. In April, Brandt and his wife, Brigitte, travel for two weeks to their vacation house in France. There the 78-year-old collapses on the Monday after Easter. Despite intense recurring pains in the abdomen, he travels on 4 May 1992 to Luxembourg. His speech “On the Architecture of Europe,” which Brandt delivers to social-democrats in the Grand Duchy, is his last appearance in public. In it he pleads mainly for the expansion of the European Community. On 10 May 1992, Willy Brandt is admitted again at Cologne’s University Clinic. Another operation, which occurs twelve days later, is aborted after only a few minutes. The cancer has spread too far. In late May, Brigitte Seebacher takes her husband home, where she cares for him in the months that follow. In the course of the summer, Brandt often receives visits there from his children as well as from friends and old companions. Egon Bahr and Klaus Harpprecht are often there. Those who also bid him farewell personally include Helmut Schmidt, Hans-Jochen Vogel, Hans-Jürgen Wischnewski, Holger Börner, Hans Koschnick, Johannes Rau, Richard von Weizsäcker and Felipe González. On 27 August, Helmut Kohl is a guest at the house in Unkel. Brandt advises the Federal Chancellor on his wishes for his funeral. 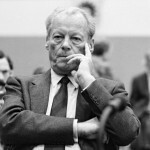 The terminally ill Willy Brandt is not able to participate in the Congress of the Socialist International (SI) in mid-September 1992 in Berlin. However, he sends a greeting to the delegates meeting in the Reichstag Building. His wife Brigitte writes the text to which Brandt then makes some minor improvements. The moving farewell message is read on 15 September 1992 by the former SPD chairman, Hans-Jochen Vogel, and is a political legacy. In it Brandt calls for a global commitment against injustice and for human rights. He characterises it as especially satisfying that the Internationale under his presidency has become a “truly worldwide community.” The Congress elects the French socialist, Pierre Mauroy, as the new SI President. 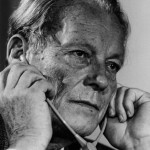 After a serious illness, Willy Brandt dies at the age of 78 on 8 October 1992 at 4:35 p. m. in his private residence at Auf dem Rheinbüchel 60 in Unkel.